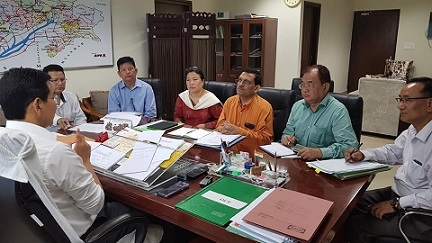 Arunachal Pradesh Sports & Youth Affairs and Agriculture Minister Dr Mohesh Chai on Tuesday convened a review meeting to take stock of the implementation of Chief Minister’s Krishi Rinn Yojana (CMKRY) at his office here. The meeting after detailed discussions came to a conclusion that most of the commercial banks were not giving importance in implementation of the scheme and other State flagship schemes likewise, which have been particularly designed to benefit the farmers and poorer section of the society. Taking strong exception to the same, Chai asked the banks to advertise CMKRY and other schemes through various medium of communication so that every farmer of the State could avail benefits out of it. The State Government had launched the Chief Minister Krishi Rinn Yozana in May last year to provide interest subvention of four percent on crop loan/kisan credit card limit up to Rs 3 lakh sanctioned by all banks to all farmers of the State during the current financial year. Benefits under the scheme would be extended to farmers availing KCC/crop production loan from commercial banks, Arunachal Pradesh Rural Bank (APRB) and Arunachal Pradesh State Cooperative Apex Bank (APSCAB) Limited on the same terms and conditions prescribed by the RBI and the NABARD. It is to be mentioned that Chief Minister Pema Khandu has set a target of 7,500 farmers to be covered under crop loan under the CMKRY in this financial year.